After the appointment of a new board in September 2015, the Guyana National Broadcasting Authority (GNBA) has not made any meaningful step forward regarding the revocation of radio licences that were awarded under the Jagdeo regime. In fact, the Board which was led by AFC Member, Leonard Craig, earned nothing but harsh criticisms to the effect that it is, and continues to be, the most unproductive of the boards under the APNU+AFC administration. In addition to this, the board has done absolutely nothing of consequence since it was installed. The Authority is actually months late on a promised implementation of new regulations that were to bring order to the Broadcasting sector. Those regulations were supposed to force broadcasters who are holding “illegal” licences granted to them by former President Bharrat Jagdeo, to surrender their licences and to reapply under a new structure which was supposed to be free from any form of corruption or nepotism. With the GNBA being without a board since last year December, the matter of the radio licences now hangs in limbo. Last month, Prime Minister and First Vice President, Moses Nagamootoo told this newspaper that he was receiving advice on the reconstitution of the board of directors for the GNBA. Nagamootoo said that he is in the process of consulting on new names, but they would have to be taken to Cabinet for approval. 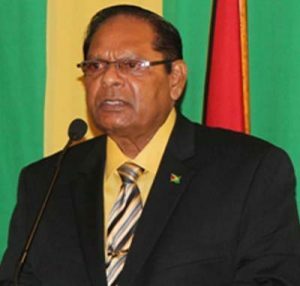 Until such time, Nagamootoo said that the Authority is well equipped with a competent Chief Executive Officer, Dr. Prudence Lewis-Bhola. The Prime Minister reminded that Dr. Lewis-Bhola has a doctorate in Transformational Leadership along with a Bachelor of Laws and a Social Sciences Degree in Communication from the University of Guyana. He said that it is his understanding that Dr. Lewis-Bhola is convinced that there is much to be done at this time and is eager to make a positive contribution to the Authority and the broadcast sector as a whole. Nagamootoo added, “So while the GNBA may be without a Chairman, there is a competent CEO in place. And in between the functioning of a board, the CEO would have to take those operational measures that are in the interest of the Authority.